Here we share our gallery of farmhouse kitchen cabinets to help you choose the best colors, finishes and designs for your home. The simplicity, charming aesthetics and down home appeal of farmhouse style kitchens continue to capture the hearts of homeowners and designers alike, making it one of the most well loved kitchen design styles up to this day. Warm, welcoming and projecting a deep sense of country comfort, the farmhouse kitchen style is one of the simplest and most practical kitchen design styles. Before it was even considered as an architectural and interior design style, the American farmhouse style was more of a functional home – one which caters to the needs of farmers and families centered around the farm life. With this original intention, different styles were combined throughout the years to produce a practical home. Essentially, the farmhouse style reflects its American heritage through the use of simple and informal design features, charming historic elements with an inspiration from nature. The farmhouse kitchen style is characterized by being unpretentious, functional and straightforward. Traditionally, people would make use of whatever it is that is available to build their homes, thus the result is a more rugged and rustic appearance. Everything was homespun and handcrafted, making the space feel more lived in and home like. 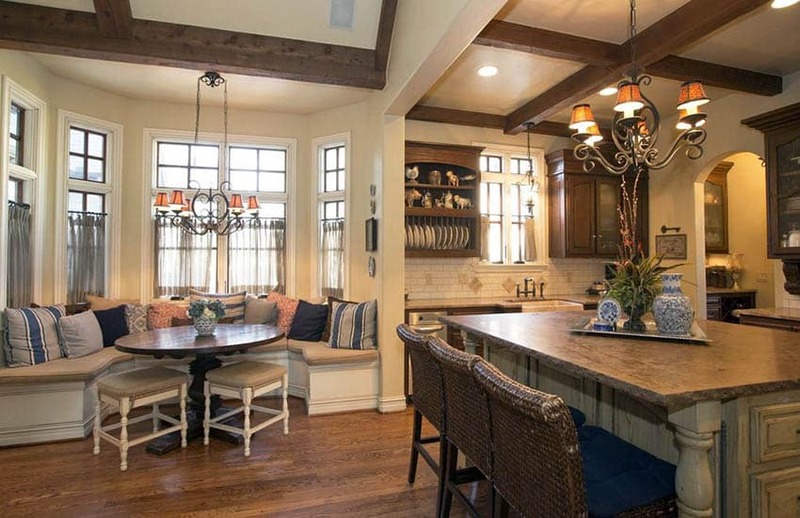 To meet the daily routines of farmhouse living, farmhouse style kitchens were designed to cater to large families, to entertain the community with a sense of welcoming hospitality and to provide a high amount of comfort. The kitchen cabinetry became one of of its key facets in design and it directly reflected what the true farmhouse style was about – simple, functional and practical. Here are some other characteristics of farmhouse style kitchen cabinets. Down home feel – In general, the farmhouse kitchen style is characterized by natural coziness and comfort which reminds us of a well lived in home. Farmhouse style kitchen cabinets are laid back, casual and less formal as compared to country style kitchens. Unpretentious design – Farmhouse style kitchen cabinets are characterized by a simple and straightforward design. Unlike French country kitchen cabinets, which are heavy on the details and put emphasis on ornamentation, farmhouse style kitchen cabinets have simple lines which are accentuated with plain trims and paneling. Natural materials – Just like the country kitchen cabinet style, the farmhouse kitchen cabinet style takes inspiration from nature and aim to bring the outdoors in through the use of natural materials such as solid hardwoods. Rustic appeal and homespun – Farmhouse style kitchen cabinets have a strong rustic appeal. Rugged elements and materials in their natural finish are abundantly used in this kitchen style. Part of the design of farmhouse style kitchen cabinets are complementing decors such as handcrafted and vintage accessories. Reclaimed wood and vintage accents – Reclaimed wood is typically used as as accent for farmhouse style kitchen cabinets. Textured touches – Another key feature of farmhouse style kitchens, in general, are textured finishes and surfaces, which are typically inherent to natural materials. Textured touches are also often incorporated into farmhouse style kitchen cabinetry through the use of mixed materials such as glass inserts, reclaimed wood accents and trims. White and light colors – The general color palette of farmhouse style kitchen cabinets are airy and bright, making use of white and light hues as the primary color for farmhouse style kitchen cabinetry. 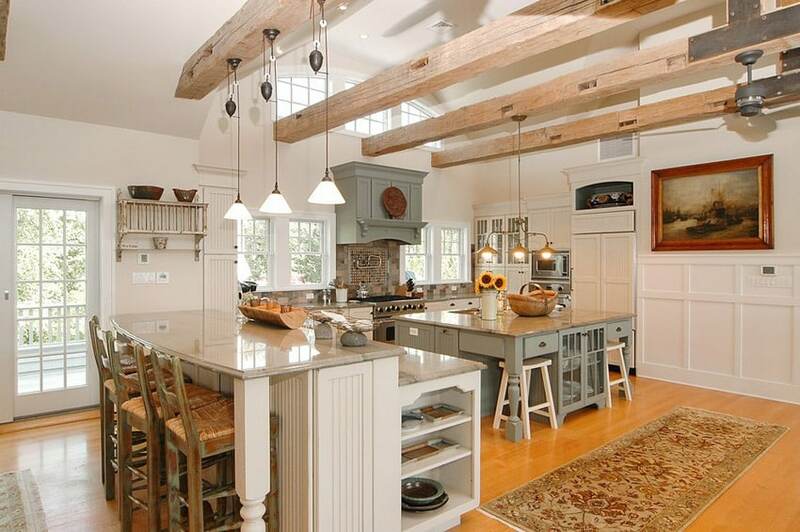 The use of natural materials and surfaces is also a trademark of the true farmhouse kitchen style. The main material for farmhouse style kitchen cabinets are natural solid wood. Unlike modern kitchen cabinets which usually feature synthetic materials such as laminates or thermofoil, farmhouse style kitchen cabinets abundantly make use of wood throughout its design. This is simply because the farmhouse kitchen style is geared towards creating a naturally cozy atmosphere and aims to bring the outdoors in, through the use of natural materials. Quality hardwood such as cherry, maple, oak and pain are the most popular choices for farmhouse style kitchen cabinets. If cherry is the signature wood of craftsman style kitchen cabinets and oak is tantamount to country style kitchen cabinets, pine is the traditional favorite for farmhouse style kitchen cabinets. Pine is a type of softwood that has a natural pale yellow color. Pine is the only species of softwood that is used for kitchen cabinetry and compared to hardwood, pine dents easily. However, its strength and quality is usually reinforced through pressure treatment before use. Common species of pine used for farmhouse style kitchen cabinetry are Eastern white pine and Western white pine. Pine is a popular choice for farmhouse style kitchen cabinets because its inherent knotty appearance make it a perfect fit for the down home appeal of the rustic, farmhouse style. Pine can either be left in its natural yellowish color or treated with wood stains to achieve a different tone. Alternatively, pine can also be painted in white or any farmhouse kitchen cabinet color as it takes in finishes very well. The farmhouse kitchen style is also known for re purposing and for giving old items a new look. Re purposing creates a timeworn feel and also renders a more rugged appeal to a farmhouse style kitchen setting. Another popular material for farmhouse style kitchen cabinets is reclaimed wood. 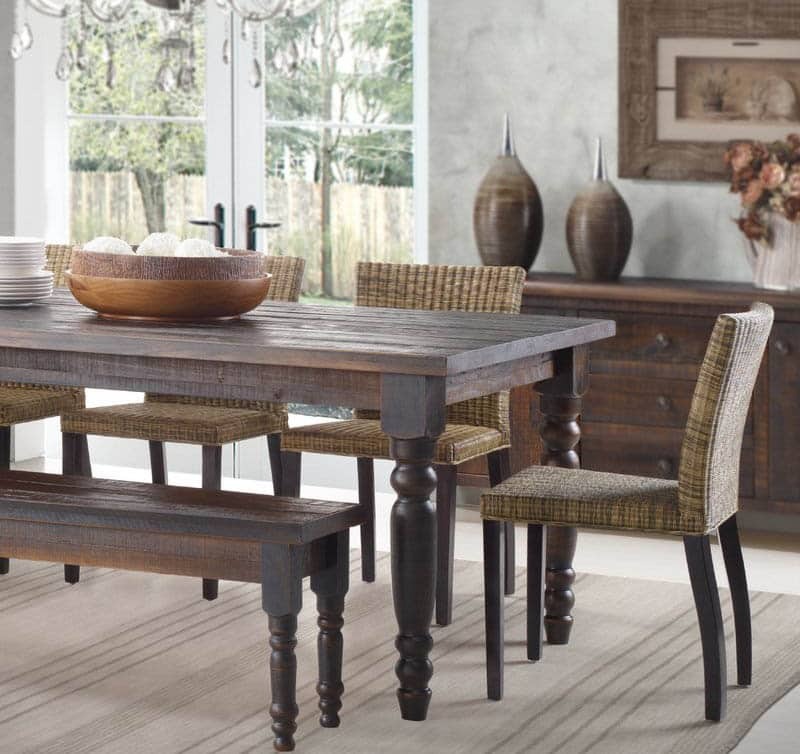 Distressed wood or reclaimed wood are salvaged old pieces of wood or used lumber which are utilized for a new purpose to create new furniture, cabinetry, decorative accents or accessories in a space. Reclaimed wood can be used in a farmhouse style kitchen setting in so many ways. Whether for cabinet doors or for open shelving units, distressed wood provides for a more rustic appeal. It can also be used as a decorative wooden hood cover for concealing range hood, pipes and exhaust systems in a kitchen. In general, the farmhouse kitchen style is also known for its unpretentious design and timeworn appeal. 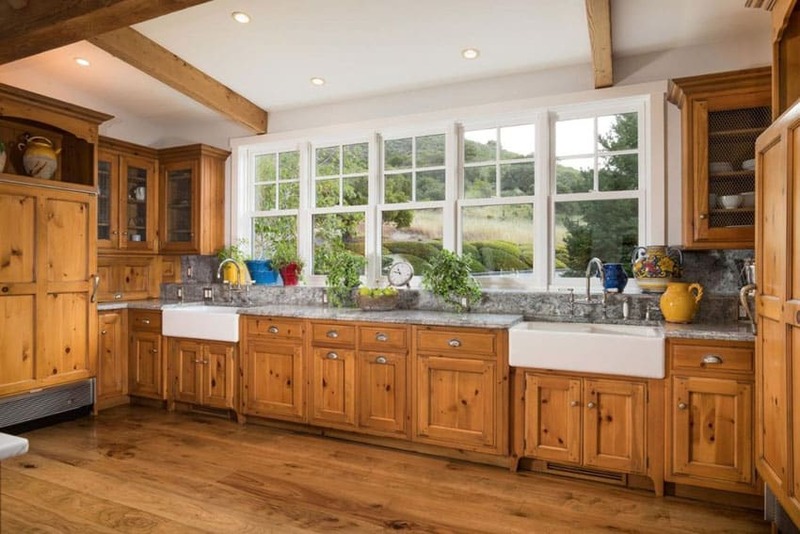 With that in mind, farmhouse style kitchen cabinets are typically left in their natural finish, or treated with a light colored paint, rather than being covered in synthetic materials such as high pressure laminates. Paint is the primary finishing material for farmhouse style kitchen cabinets. 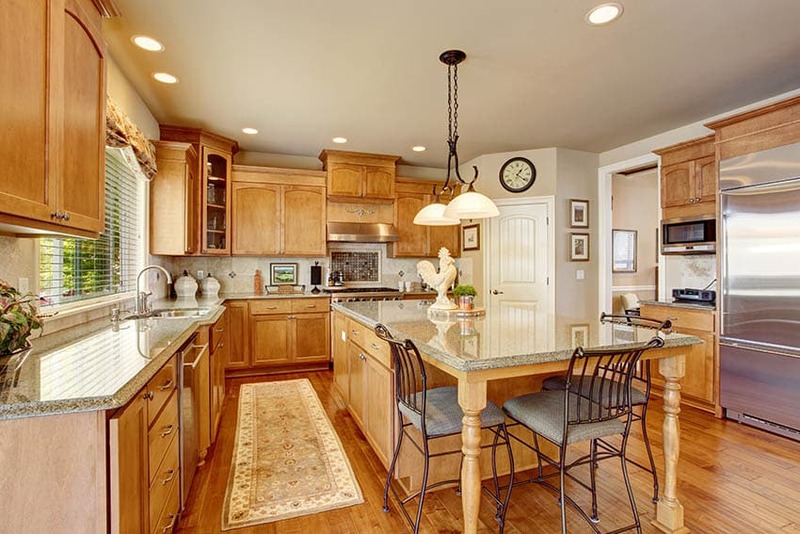 Unlike craftsman style kitchen cabinets which put premium on natural dark, rich, heavy woods, or the classic country style which also showcases wood in stain finish, the farmhouse style is set apart from the rest by its white and light colored kitchen cabinetry. White paint, in particular, is the most common finish for farmhouse style kitchen cabinets. While in some cases, white is substituted by mellow colors like beige, off white, cream or soft shades of yellow, powdery blues, cool gray and lavender. You can learn more about the common colors for farmhouse style kitchen cabinets as we go on with this article. Paint for farmhouse style kitchen cabinets is typically plain, solid and smooth. This regular finish creates a more simple and casual aesthetic, while functioning as a perfect complement to rustic decor and other rough textures and finishes. Farmhouse style kitchen cabinets do not have the heavy and ornate finish of French country kitchen cabinets. However, in some cases distressing is also used if a more aged appearance is desired. Distressing creates an authentic, weathered look and is perfect if you are geared towards the antiques and vintage decor. Another popular finish for farmhouse style kitchen cabinets is the raw or unfinished look. The natural or unfinished look for farmhouse style kitchen cabinets is often used to project a rugged appeal. Pine wood, for example, looks exquisite in its natural finish and when treated with a clear coat of wood stain, its natural knots and grains are highlighted. Staining can also be used as a finishing for farmhouse style kitchen cabinets. Aside from clear stains which enhance the inherent graining pattern and color of wood, wooden farmhouse style kitchen cabinets may also be treated with medium to dark colored stains to give them a whole new color. However, staining is still less commonly used for farmhouse style kitchen cabinets as compared to white paint. Simple Moldings – Compared to the highly ornamental French country kitchen cabinet design, details in farmhouse style kitchen cabinets are less heavy on the eyes. Decorative trims with simple profiles can be found around the center panel of kitchen cabinet doors or above the perimeter of overhead kitchen cabinets. These decorative moldings are also carried out along windows found in the kitchen to emphasize their scale and give them prominence. Wooden hood cover – The vent hood is one of the key spots to display rustic farmhouse details. 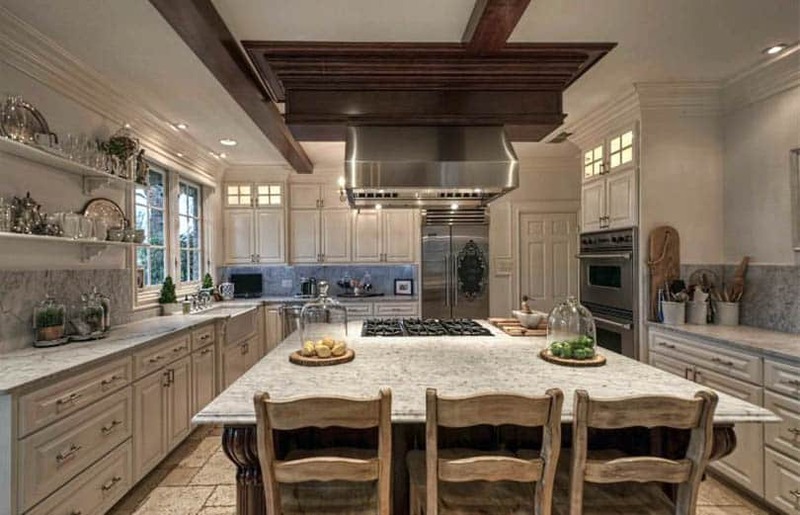 A trademark of farmhouse style kitchens are wooden hood covers whose design was based on craps of short, random pieces of wood which are reclaimed and joined together to build canopy or a vent hood. Range hood appliances are typically made up of metal and in order to fit a more traditional kitchen setting. 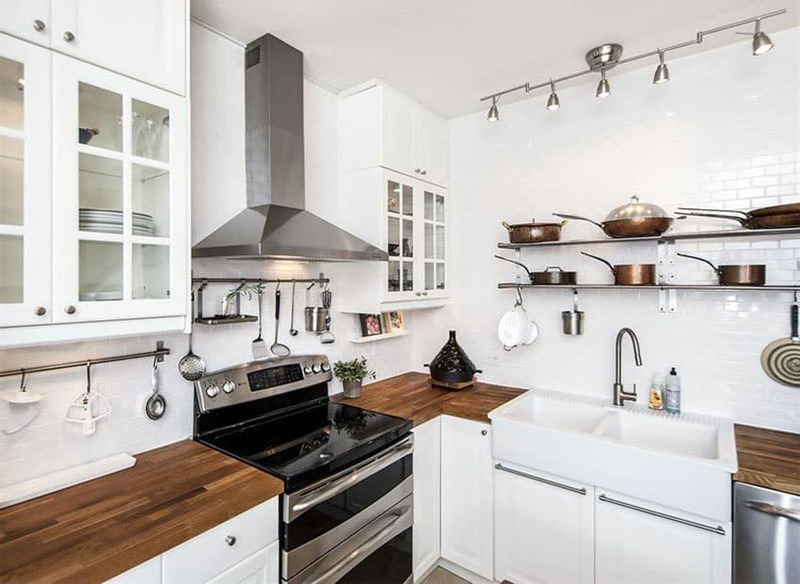 Wooden hood covers are added above the stove top to create a more uniform, consistent look while serving the practical function of concealing ducting, pipes and kitchen exhaust systems. 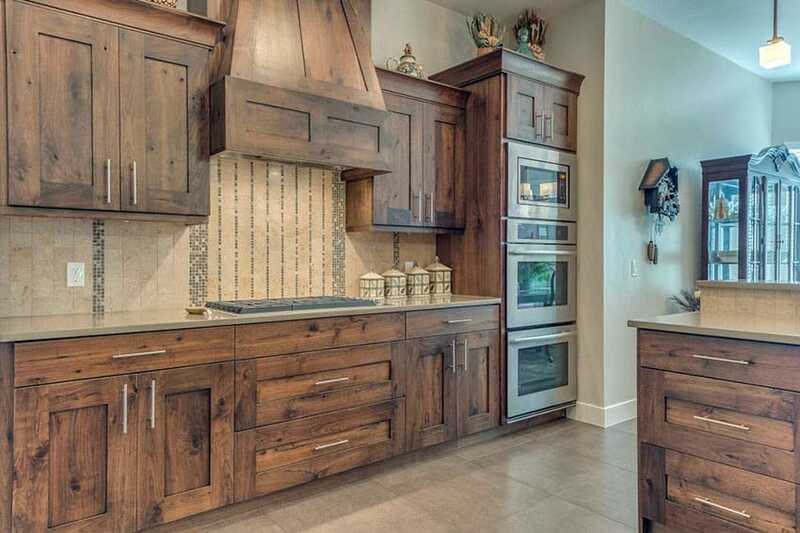 Wooden hood covers may either be highly decorative or plain, but for farmhouse style kitchens, they are usually made up or reclaimed wood in a natural finish to fit the rustic appeal of this kitchen cabinet style. It also takes on different shapes such as a simple box shape or a tapered shape, which typically runs from the ceiling down to the termination of the range hood. Beadboard – Beadboard panels are a popular feature of farmhouse, country and cottage inspired homes. Beadboard panels are series of long, narrow wood planks that are joined together at an upright, vertical position. It is traditionally used as a decorative wall treatment, but later on became well known as a cabinet door design. Aside from being used as a treatment for farmhouse style kitchen cabinet doors, beadboard panels may also be added as backsplash, detailing on center island faces or accent walls to contribute country charm to kitchens. You can learn more about beadboard cabinet doors as we go on with this article. 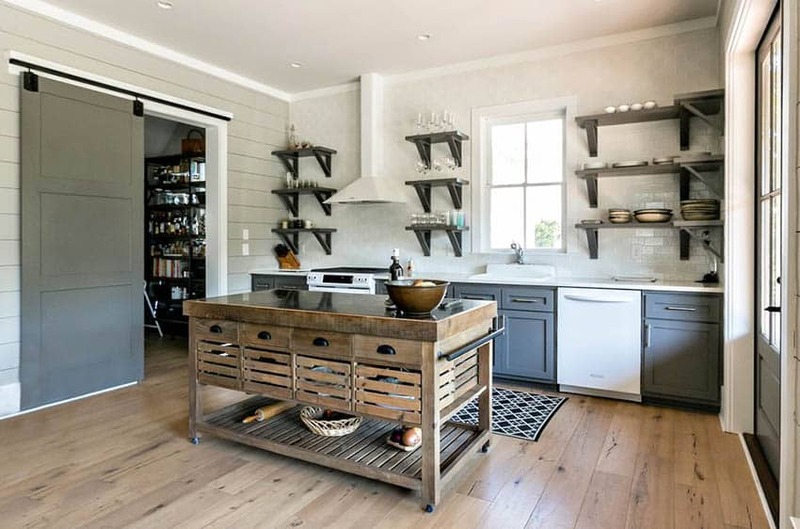 Open shelves – Open shelves are usually added to farmhouse style kitchen cabinets for displaying rustic accessories and auxiliary items such as knick knacks and choice dinnerware, cookware or decorative items like mason jars. Farmhouse style kitchen cabinet doors are known for their comfy and casual or laid back vibe. Its design is more basic and less formal compared to the rich details of a French country inspired kitchen cabinet design. The straightforward design of farmhouse style kitchen cabinet doors are often accentuated with simple details like glass inserts or a wooden beadboard panel. Shaker style cabinet doors – Shaker style kitchen cabinet doors are one of the iconic trademarks of farmhouse kitchen settings. By definition, a Shaker style kitchen cabinet door is a five piece door that has a recessed center panel. Although its mostly used in contemporary and modern inspired settings, Shaker style kitchen cabinet doors are a favorite for farmhouse kitchens because of their charm, simple aesthetics and laid back appeal. Shaker style cabinet door have a clean look, which makes them a perfect match for the unpretentious design aesthetic of farmhouse style kitchen cabinets. Farmhouse style kitchen cabinets with shaker style cabinet doors are typically made up of quality hardwood such as maple, quartersawn oak or hickory which are usually left in their raw, natural finish. Alternatively they can be painted in white or light colored paint to give farmhouse style kitchens a more airy feel. Beadboard style cabinet doors – Beadboard style kitchen cabinet doors are a signature look of country, farmhouse and cottage style kitchens. Traditionally used as a decorative wall treatment for bathrooms, kitchens and living rooms before plastering and drywall became famous, a beadboard panel is a row of narrow wood planks that are lined up vertically. Each piece of wood plank has a little ridge in between and this joint where each plank meets is called a “bead”. Beadboard panels are traditionally made using tongue and groove connection to perfectly join the pieces of planks together in a uniform single panel with vertical slats. However for beadboard cabinet doors, the grooves or ridges are just carved into the center panel of the wood to simulate the look of traditional beadboard panels. 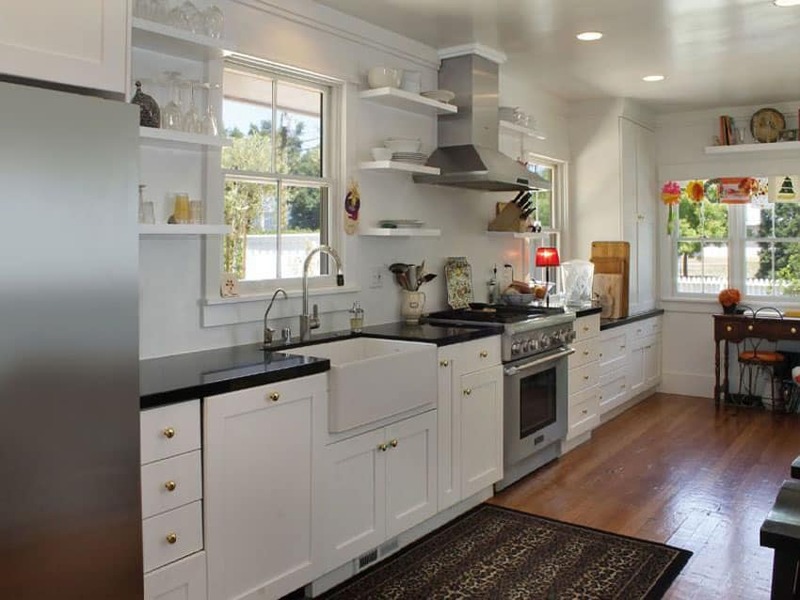 Typically, beadboard kitchen cabinet doors for farmhouse style cabinets are painted in white or a light colored paint. 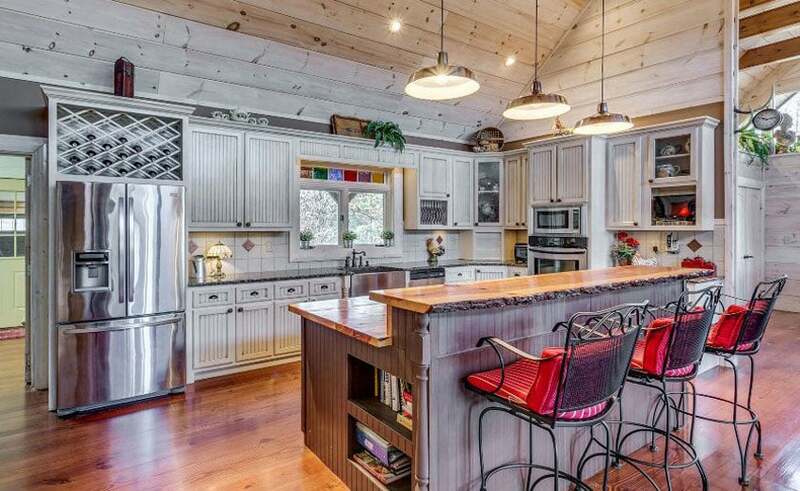 They contribute a rustic feel and cottage charm to kitchens, making them feel more homespun and cozy. 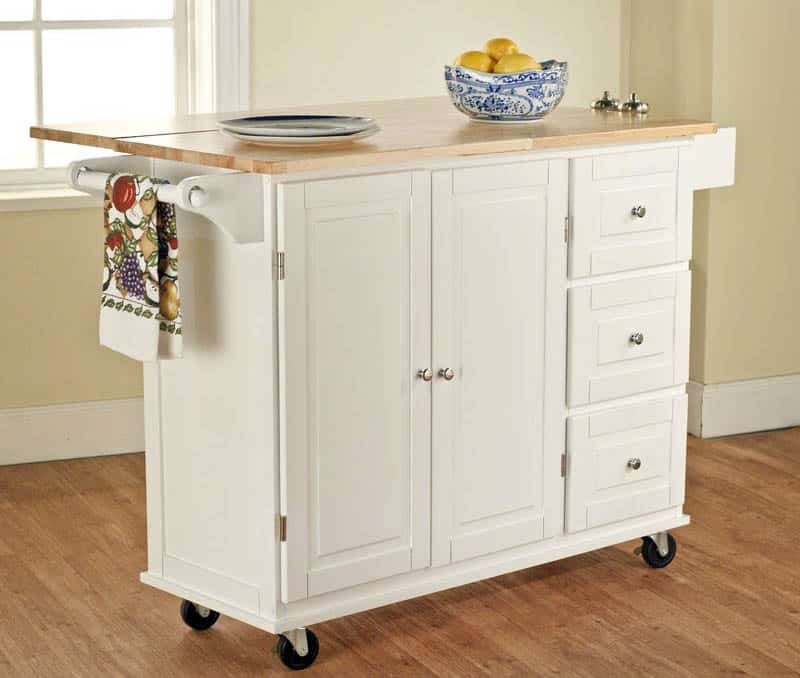 Beadboard style kitchen cabinet doors are tantamount to quaint country essence. However, there is one major drawback of using bead board kitchen cabinet doors, which is the maintenance it requires. The grooves and slats in between the cabinet door can be hard to clean, as dirt and grime can easily get stuck, but with a little wiping, your beadboard style kitchen cabinet doors can maintain its natural beauty. Glass cabinet doors – Glass cabinet doors may be used as accent doors to highlight a portion of farmhouse style kitchen cabinetry, or it may be used to furnish a whole wall of overhead kitchen cabinets. Cabinet doors with clear glass inserts are often used to display cookware, dinnerware and chic containers to reflect a down home theme. 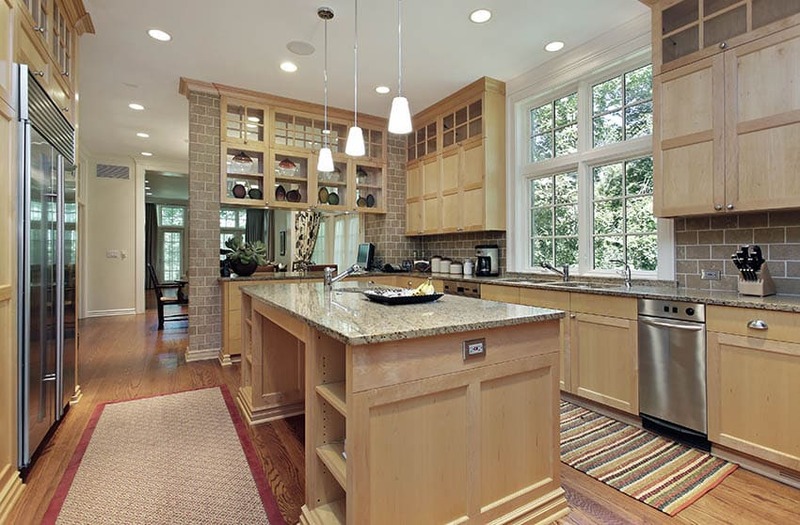 In addition, glass cabinet doors also give farmhouse kitchens an overall open and airy feel. In terms of functionality and accessibility, glass cabinet doors also give full visibility of the contents inside the storage, thus it is easier to look for something you need. Clear glass are the most common type of glass used for farmhouse style kitchen cabinet doors. Alternatively, leaded glass or stained glass panels may be used as doors for farmhouse style kitchen cabinets for a true farmhouse flair. To improve the look and functionality of glass cabinet doors for farmhouse style kitchen cabinets, task or interior cabinet lighting may be added. Chicken wire kitchen cabinet doors – Farmhouse style kitchen cabinets are known for their don home appeal and to create a more laid back “country side” and farm like vibe, cabinet doors are sometimes also treated with chicken wires. This is also a good way to give existing kitchen cabinets a rustic update. Replacing existing kitchen cabinet doors with chicken wire fastened to a frame is a quick, easy and cost effective fix to create a farmhouse style kitchen. Other popular kitchen cabinet door designs used for farmhouse style kitchen cabinets are recessed panel doors, raised panel doors and flat panel doors. Hardware for farmhouse style kitchen commonly have an antique finish and a simple profile. Cabinet pulls, knobs and handles do not have a highly ornamented surface, but instead they are straightforward and functional. Common types of cabinet hardware for farmhouse style kitchen cabinets are wire pulls, knobs cup and bin pulls. Wire pulls are simple handles which are used for cabinet doors, while cup and bin pulls are typically used for drawers. Knobs, on the other hand, are small kitchen cabinet hardware which are attached to kitchen cabinet doors or drawer faces using a single single. They are generally round in shape, but also come in other forms such as square, rectangle, oval, crystal or novelty. Farmhouse style kitchen cabinet knobs have simple shapes and are typically made up of metal in a dark color finish. There are also some other designs which make use of porcelain and wood. Knobs for farmhouse style kitchen cabinets may also include designs which are printed on the surface such as flowers, gingham patterns, roosters, etc. Cup bins and pulls are the signature hardware of traditional style kitchen cabinetry, but rather than being used for cabinet doors, these are typically utilized for drawers. Their old fashioned charm and vintage beauty makes them the perfect cabinet hardware for farmhouse style kitchen cabinets.Cup bins and pulls are characterized by their half moon or semi circular shape. Cup bins and pulls are installed with the open side facing downward and uncle open pulls and handles, this can only operated on one side. There are also kitchen cabinet hardware which are made to specifically fit the farmhouse style and these designs often feature interesting pastoral and country themed details like a small rooster motif, or a printed gingham pattern or a hand painted floral or leaf motif. Some have decorative backplates which feature carved details and cut outs. Aside from metal, porcelain and glass are also popular materials for farmhouse style kitchen cabinet hardware. The finishes for farmhouse style kitchen cabinet hardware are generally antique looking, rugged, timeworn and dark in color. Black and dark browns kitchen cabinet hardware are commonly used with farmhouse style kitchen cabinets. Strong dark colors in a deep, warm finish give a historic feel and produce great contrast with white colored farmhouse style kitchen cabinets. Venetian Bronze – The color of Venetian bronze cabinet hardware is very dark that it is almost close to black. But one of its unique attributes is the appearance of deep brown undertones. In terms of appearance, Venetian bronze is darker than oil rubbed bronze. Just like black metal kitchen cabinet hardware, Venetian bronze also pairs well with farmhouse style kitchen cabinetry because it brings a stark element of contrast. When paired with farmhouse style kitchen cabinetry, Venetian bronze cabinet hardware adds a strong rustic vibe. 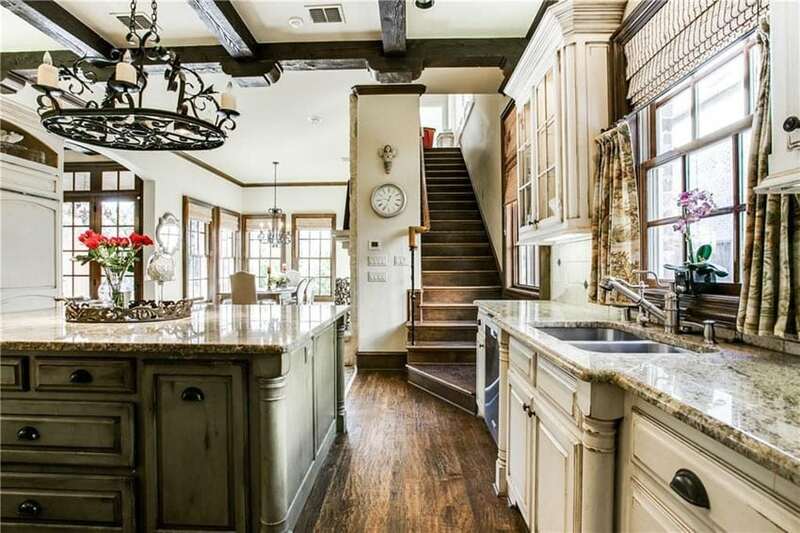 Old Antique – Old antique kitchen cabinet hardware are abundantly used in traditional kitchen cabinetry because of the Old World, historic and timeworn feel. Their rustic appearance makes them a perfect fitting choice for the rugged aesthetics of farmhouse style kitchen cabinets. Old antique kitchen cabinet hardware is characterized by a unique deep chocolate brown ad is well suited for light colored and white farmhouse style kitchen cabinetry. The farmhouse kitchen style is all about creating a cozy atmosphere and projecting a sense of laid back comfort. To create such environment, the color palette of farmhouse style kitchens are light and bright in general, and more easy on the eyes. You will not see the deep, rich hues that are authentic to the French country style, but instead farmhouse style kitchens are predominantly neutral. Whites, grays, shades of brown are a staple in this type of kitchen style. While the accent colors are usually mellow to promote a cheery ambiance and a charming style. 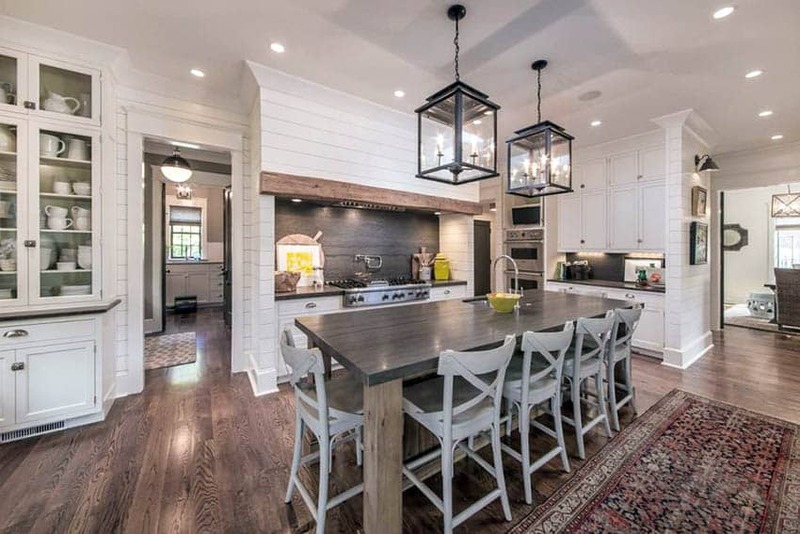 Farmhouse style kitchens heavily make use of whites in its overall color palette, thus it is also the most popular kitchen cabinetry color for this setting. White kitchen cabinets combined with rustic wood elements are tantamount to the farmhouse kitchen style. Beige, creams and off whites are also more widely used as compared to dark woods. Other alternatives for farmhouse style kitchen cabinet colors are soft, muted shades like cool grays, soft blues, beige and light taupe. 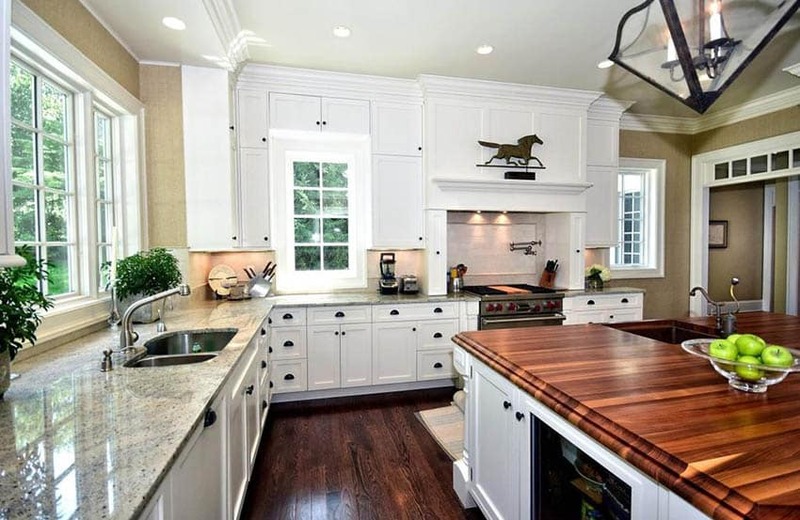 Natural wood finishes are also common in farmhouse style kitchen cabinets. Light and medium stained woods with prominent graining patterns are more favored in projecting natural coziness and warmth to a space. Country Farmhouse kitchen cabinets are also often left unfinished in their distinct natural colors or enhanced with wood stains. Wooden farmhouse style kitchen cabinets in natural finish also give off a more rustic feel to the space. White is the signature color of farmhouse style kitchen cabinets. White cabinets generally help make farmhouse style kitchens feel more bright and airy. Aside from the classic charm that white farmhouse style kitchen cabinets project, they also have a more casual look as compared to dark, heavy and rich woods. As mentioned, farmhouse kitchens with white cabinets are more easy on the eyes as compared to kitchens with natural finished or stained wooden kitchen cabinets. They are less formal looking and provides added versatility and flexibility in terms of design. The use of white kitchen cabinets is a farmhouse style setting allows the homeowner to easily mix and match decor , furniture and furnishings within the space. In addition, white farmhouse style kitchen cabinets also pair well with almost anything, so one can easily experiment with wall colors, flooring and backsplash material, as well. It also provides a good way to introduce other colors which will add more life to a farmhouse style kitchen. White farmhouse style kitchen cabinets also match well with any type of kitchen cabinet hardware finish, allowing you to create contrast or harmony within the overall color scheme. In summary, white farmhouse style kitchen cabinets function as a neutral backdrop that creates flexible setting for introducing splashes of color throughout your palette. White farmhouse style kitchen cabinets are also more ideal for small kitchens as they can create an illusion of a bigger space. White farmhouse style kitchen cabinets also bounce off natural light better, thus creating a more illuminated, fresher and airy feel for the home. Another major advantage of using white farmhouse style kitchen cabinets is that they are timeless and are proven to never go out of style. Especially when paired with browns and natural woods, this classic combination can stand up to the test of time. As an alternative to the bright, crisp color of white, beiges, creams and off white may also be used as a paint color for farmhouse style kitchen cabinets. Beige has a slightly yellowish tinge that adds a subtle amount of warmth to the color palette, while still functioning as a neutral base. So in terms of pairing and matching with accessories, decor and furnishings, beige farmhouse style kitchen cabinets are also easy to work with. Another popular option for farmhouse style kitchen cabinets is the distressed white finish, in which the surface of the cabinets are subjected to repetitive sanding and distressing, then covered with a top coat of antique glaze. Distressed white farmhouse style kitchen cabinets can be used if you want to render a more timeworn feel or weathered appeal. Alternatively, white farmhouse style kitchen cabinets may also be left in a plain, smooth finish and matched with antique hardware if a more casual setting is desired. To add interest to farmhouse style kitchens with white cabinets, make sure to combine cabinetry with wooden accents. These wooden accents may be introduced as a wooden hood cover, as a decorative trim or as paneling. Combing white farmhouse style kitchen cabinetry with wood accents create contrast and diversity, making the space less dull and boring. The use of rough textures and complementing natural materials can also help enhance the rustic flair in a farmhouse style kitchen with white cabinets. To produce a more rustic inspired setting, pair white farmhouse style kitchen cabinets with light natural stone counters such as limestone, soapstone or marble. Alternatively, feature a classic butcher block or wooden countertop to go with white farmhouse style kitchen cabinets. White and brown are considered as a “favorite” in the farmhouse kitchen design scene because of the natural coziness that they render to a space. The country kitchen style, in general, are best known for their warmth and comfort, distinct down to earth appeal, homespun look and abundant use of natural materials, so in essence, the country kitchen style and farmhouse kitchen style are alike in so many ways. The country kitchen style branches out to different inspirations such as the English country, French country, country farmhouse, etc. Compared to its French country and English country counterparts, the country farmhouse style offers a more laid back vibe and down home atmosphere. French Country is typically dark, heavy and antique looking. While country farmhouse kitchens project a more toned down look through the use of simple wooden kitchen cabinetry, light colored natural stone countertops, reclaimed wood accents, plaid and gingham cloths, rustic wooden utensils, mason jars, vintage tin cans, antique farm equipment , farm animal decors and artwork. In summary, they are less traditional looking, have a less formal and lighter ambiance that gives guests a welcoming and highly comforting feel. If the farmhouse kitchen cabinet style’s signature look is white painted cabinets, country farmhouse style kitchen cabinets abundantly make use of wood in natural finish. This kitchen cabinet style combines an unpretentious design which natural elements, textures to create a rugged aesthetic and rustic appeal. Country farmhouse style kitchen cabinets also have minimal decor but instead puts priority on practicality, functionality, comfort and simple living. Some common cabinet door designs featured in Country Farmhouse kitchen cabinets are flat panel doors,Shaker style doors, raised panel doors and recessed panel doors. 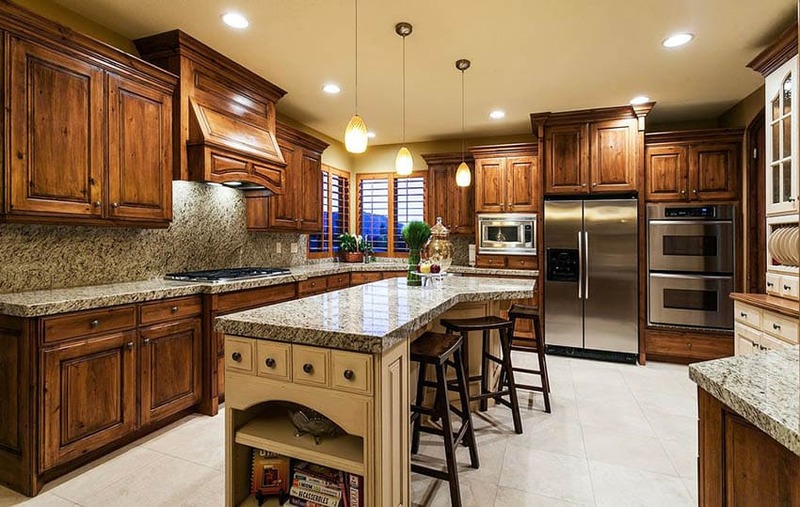 Simple trims and decorative molding paced along the borders of the center panels and above the overhead cabinets or base cabinets are lso used as decor for this type of kitchen cabinet style. In some cases, a more artistic touch is added to country farmhouse kitchen cabinetry design by using rich detailing and carvings which feature farmhouse scenes and pastoral setting. 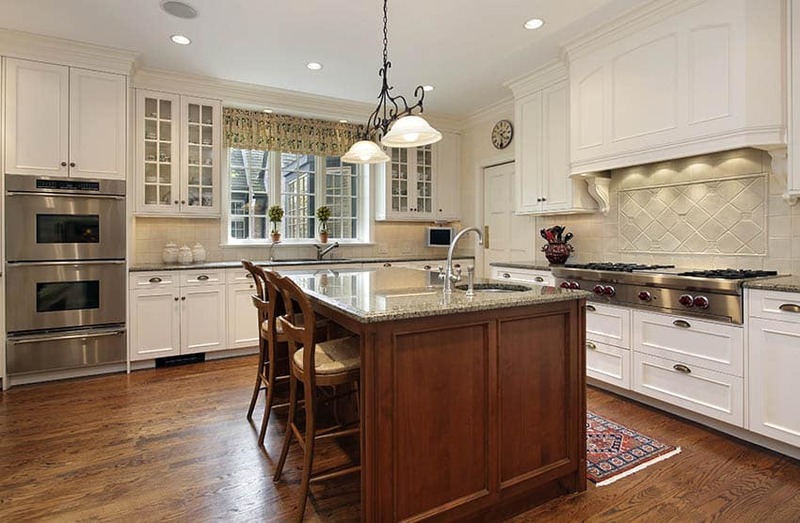 Country farmhouse kitchen cabinets also focus on sturdy build that ensures the cabinets to last a lifetime. To make sure that the country farmhouse kitchen cabinets have a long lifespan, natural materials like hardwoods are abundantly used and fitted well during construction . Country Farmhouse kitchen cabinets are typically constructed from high quality solid wood like cherry, oak, maple, redwood, fir and pine. Add a farmhouse sink – An important feature in Farmhouse style kitchen cabinetry is a deep, oversized sink that has a large apron. It is generally larger in size compared to regular sinks and is usually top mounted over base cabinets. 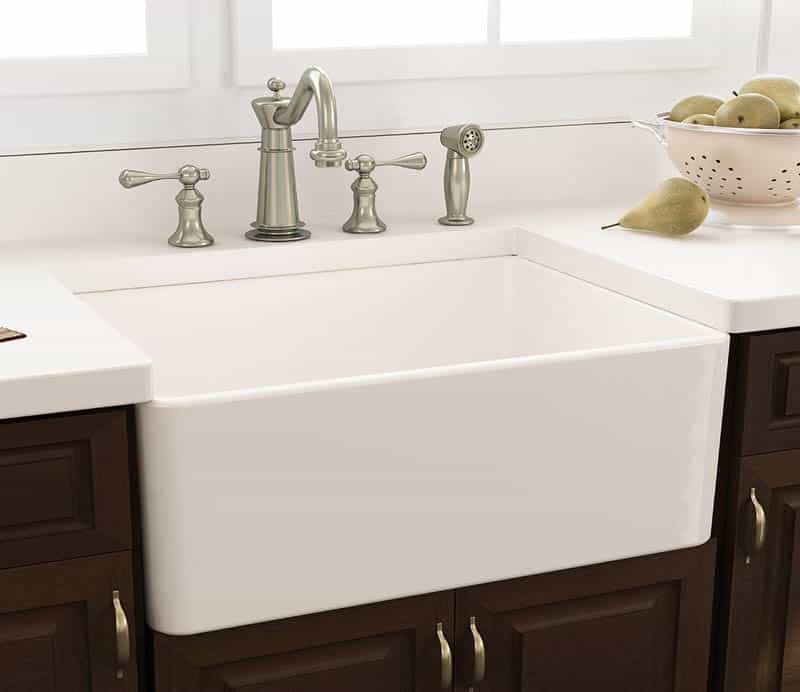 Traditionally, farmhouse style sinks were meant for storing larger amounts of water during the time when it was still fetched from wells or a nearby body of water. It was also traditionally used for preparing large meals, washing big pots and pans, doing the laundry or even for bathing a baby. 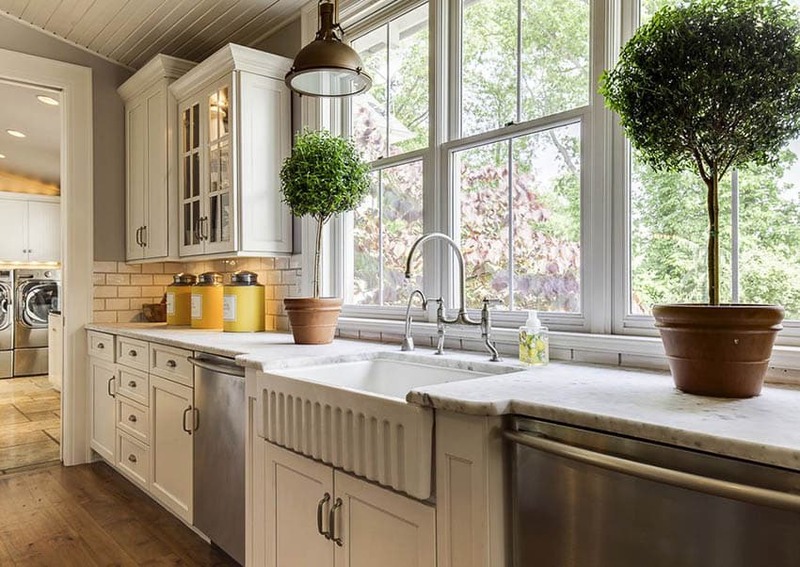 The idea behind farmhouse style kitchen sinks is to enable the use to stand directly in front of the sink, with no countertop or cabinet in between. 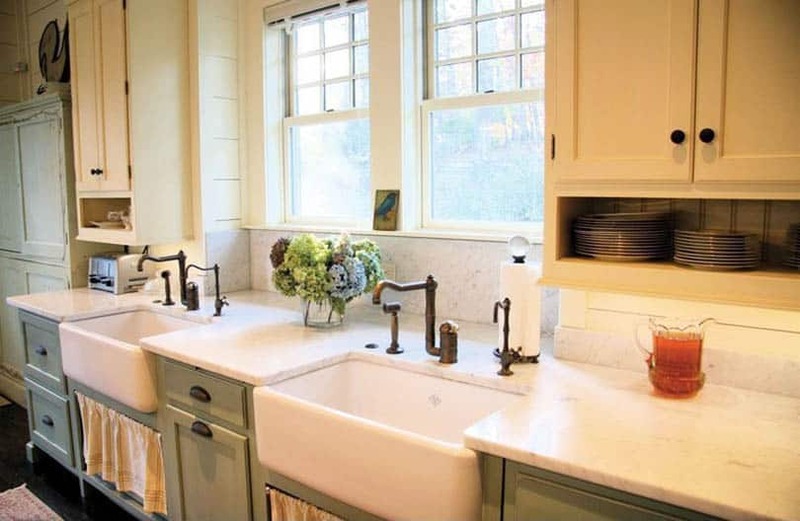 Farmhouse style sinks are very popular nowadays and are widely available in the market. They are typically made up of porcelain, cast iron or stainless steel and are very durable. 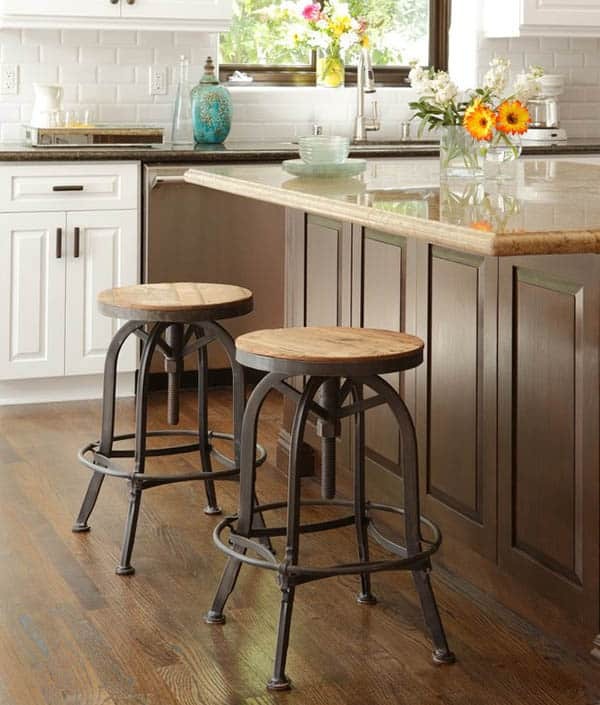 Use butcher’s block or wooden countertops – White kitchen cabinetry and chunky butcher’s block countertops are a classic combination for farmhouse style kitchens. A favorite in true farmhouse style kitchens, butcher blocks add natural warmth and coziness, while bringing in contrast to white kitchen cabinetry in a space. In addition to aesthetics, butcher blocks and wooden countertops are highly durable and can serve different functions in food preparation such as kneading the dough and chopping ingredients . Display vintage accessories and farmhouse style decor in open cabinetry – Farmhouse style kitchen cabinets are also often combined with other rustic elements and decor to reflect that distinct down home feel. 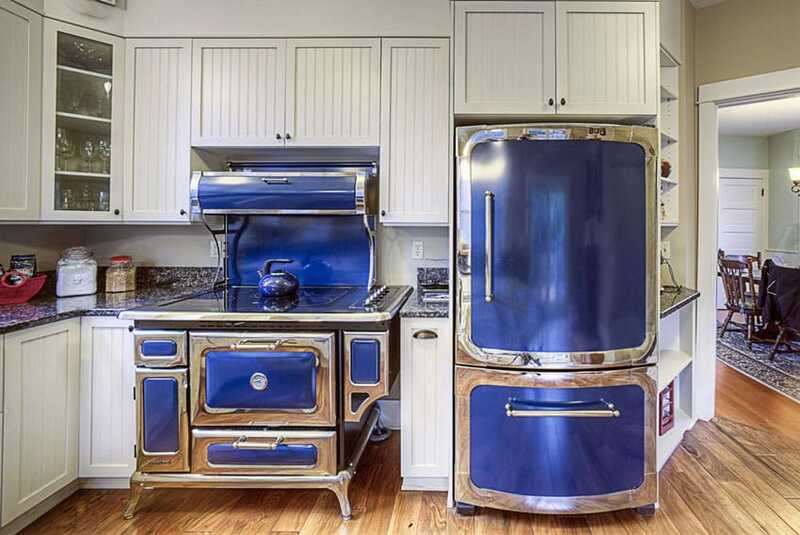 Vintage accents and old fashioned accessories are also displayed in the cabinets to create a more “lived in” feel. Enhance farmhouse style kitchen cabinets with simple dinnerware, cookware and flatware arranged in tasteful combinations or display antique and vintage tins. Mason jars are also another trademark of true farmhouse style decor. 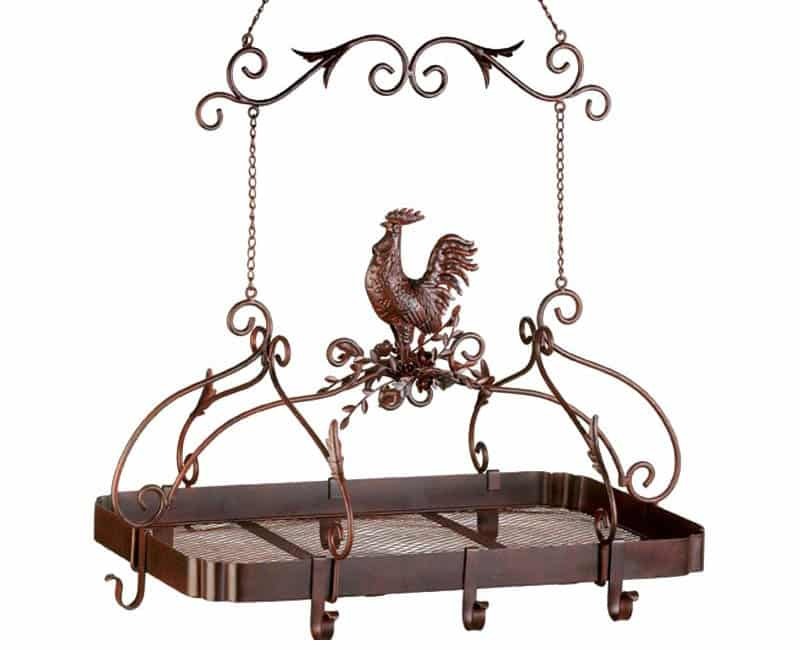 Add a touch of rooster decor – Rooster decor are commonly found in farmhouse and country style kitchens to reflect the countryside or farm style living. Adorn kitchen countertops, open shelves and cabinetry with rooster home accessories to add a chic and playful touch. Rooster decor are available as carved figurines, metal art, artwork or painting or as motifs for jars, tissue holders, dinnerware, glassware and other kitchen tools. It is also often used as prints for textiles and soft furnishings like tea towels, curtains, pot holders, etc. Add texture for a more rustic vibe – To create variation in texture, combine different materials in completing the look of farmhouse style kitchens. Use textured or unfinished wood, natural stone and other materials which can add depth and dimension to the overall design of the space. To tone down the hard surfaces and add a welcoming relief in a farmhouse style kitchen, incorporate plants and baskets into countertops, open shelves and cabinetry. Repurpose old items – Charm can be added in a true farmhouse style kitchen through using old items for a new purpose. Old pieces such as recycled jars, bottles, antique tin cans, old wood are given new life as part of the decor in farmhouse style kitchen cabinetry. Use salvaged or reclaimed wood – In conjunction with repurposing, old and reclaimed wood can be used as accents in a farmhouse style kitchen to give it a more rustic feel. Create a statement in your kitchen by using old wood as a wall accent, a decorative trim or molding or as a wooden hood cover. You can also use it to create a grander feature in your kitchen as a bar or center island or small built in breakfast nook. 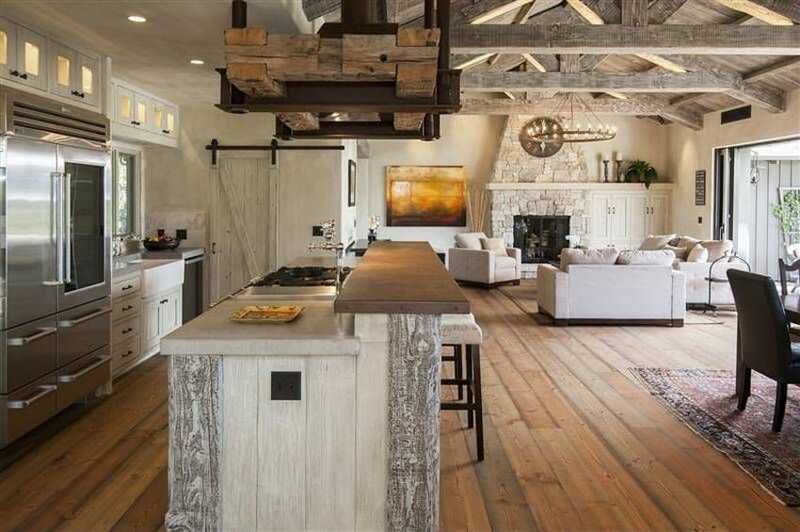 Alternatively, reclaimed wood can also be used as exposed ceiling beams to create a more natural feel for a farmhouse style kitchen. Complement farmhouse style kitchen cabinetry with a “farm table” – If the space in your home permits, pair farmhouse style kitchen cabinets with a classic farm table. Farm tables are made up of long planks of high quality woods such as oak, which are fitted closely together to create a sturdy furniture. Match farm tables with chairs that have legs or backs which feature rich details and carvings of farmhouse and pastoral scenes.